A stiff sou’wester whirls through the ships’ riggings like an enormous harp. The clippers are moored, lazily rocking on the incoming tide, their beauty beyond compare. The powerful teak and iron hulls are like stallions, jerking anxiously to free themselves from the narrow harbour and go out to sea, towards freedom! The ships’ names perfectly match this uncontrollable urge: Brilliant, Thomas Stephens, Serica, Salamis, Cimba, The Tweed, Patriarch, Thermopylae… Cutty Sark. This last name makes me hold my breath: the ship of my dreams. How often did I stroll to the Channel coast, scanning the horizon for her white pyramid of sails, waiting in vain as she proved to have docked long before anybody even knew? Some said she never sailed in the first place, let alone broke the record. But insiders knew better: under Richard Woodget Her Ladyship at last became what she was meant to be ever since she was launched: the most beautiful and fastest ship in the fleet, though not in the tea trade but in the wool trade. And so she is lying here before me, rocking gently as if she breathes. The mooring rope groans at her pull. Her motions are easier than the other clippers’, as if her skipper’s perfect mastery vibrating his body down to his finger tips and beard hair, extends through the whole ship. 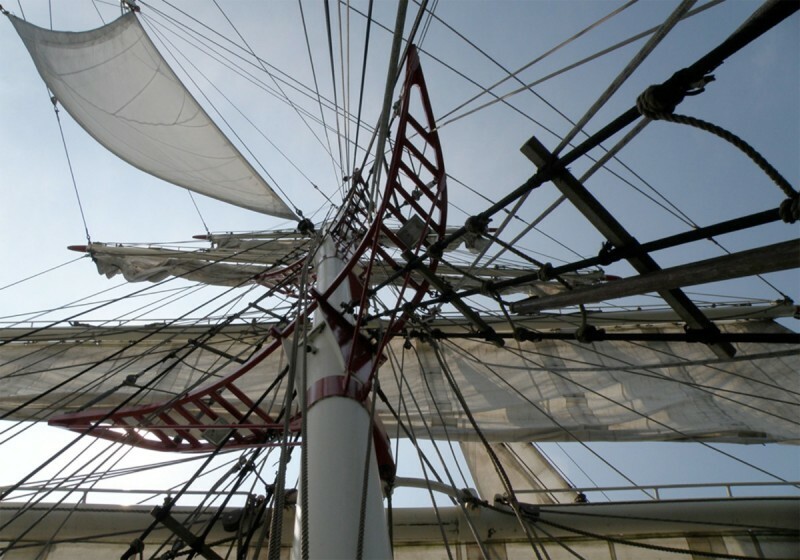 It seems as if the other ships feel somewhat uneasy in her company, just like when they reef their topsails while Cutty Sark comes tearing along under all plain sail. My eyes caress her sleek, perfectly balanced hull lines. The sun’s reflection plays over her dark planking, the seams following her gilded sheer in one smooth flow from stem to stern. Her rigging is edged sharply into the stormy sky, seagulls filling the air trying to beat Jonathan Livingstone. The British mercantile marine flag makes the spanker gaff swing, and the wind roars through stays and halyards as if they were a pine forest. Suddenly, the sun comes out, pouring its golden light over the figurehead. And I am lost in love. Does my imagination fool me, or did she really move her lips when far away Kathleen Ferrier’s alto voice tenderly hummed the folk tune? Was that a sigh, filling her lovely bosom? Besides… did she not stretch out her óther arm just now…? “What sail is this?” is my first question as we drag it on to the fore deck. “Woodget didn’t leave the deck for three days. Catching up right now. Well, after you!” He points at the jib boom so I crawl onto it, struggling with the sail along the footropes. There is no boom net. Looking back to my nameless companion I cannot help but look at the figurehead’s pretty face – and lightning strikes: I could honestly have sworn she closed her eyes and formed a kiss with her lips… I strain my eyes but again I am not sure. “Will you hurry up?” my shipmate calls, and I return to conscience. Our combined efforts move the sail forward. I have to concentrate as I bend it: every time I close my eyes her lovely face flashes before me. My shipmate belays both sheets, downhaul and halyard. On the way back to the deck I manage to avoid her looks. We crawl into the foc’sle to get acquainted. See the cable run down clear! Rolling home, dear land, to thee! Suddenly, the almost solemn scene is rudely torn by a terribly off-key steam whistle. Selby rises first: “Okay boys, fore and aft!” and we rush on deck, to the bollards and… up aloft! I am at the helm as the tug can hardly keep up with the ship now that one sail unfolds after the other. My heart is delighted: I feel myself merging into the ship as she responds to every single spoke of the wheel. The spanker fills above me, she heels and accelerates in the squalls. The compass steadily shows 120 degrees. I can almost steer with my finger tips; the music in the rigging and outside the lee bulwarks nearly make me burst into an aria from Wagner’s Flying Dutchman. Toby is far too soon in releasing me from the wheel: “You take a quick nappie, it’s your turn on the lookout tonight.” He is right, I am in the dog watch which in this weather is a dark job. Eight bells. My first dog watch. It’s really gone to blow. Cutty Sark rolls and heels, I can hardly stand upright. But she still seems to carry her full suit; Woodget is a real “driver”. I can see nothing but a faint red and green glow on either side of the heeling foredeck. The bow wave roars loudly but smoothly, just about thirteen knots I reckon. Her sweet voice does not scare me as it blends perfectly with every sound around. It is as though I expected her. She relaxes against the capstan. Moonlight radiates her body from within, leaving her shadowless. The storm makes her hair dance, but she remains untouched by the ship’s violent leaps. Even when she leaves her position and stretches her arms towards me, she seems to be in another dimension. One last bow, and then she rests again at the port railing, inviting me into her widespread arms; I cling to the ship’s bell – I should have struck one or two bells long ago, shouldn’t I? But she is too strong, her smile is of the purest love, the deck heels heavily, I almost let go… “Come to me…” she whispers, “… my body is soft… caressingly soft… as soft as the ocean’s foam… from which I was born…” the ship rolls again, I lose all my grips, the bell tolls… and next moment the night is one endless embrace, one breathtaking kiss, as stormy as the ocean itself. Her perfume fills my lungs, her longing sighs blend with the screaming wind, I join her in a wild opera duet, fortissimo… and in perfect two-part harmony we plunge into the Tasman Sea.